How many of you, reading this post, have kids? If you do, perhaps this post will resonate with you. One of the most difficult things for me, when my kids are staying with me, is to get them outdoors. By that I mean, to get them to do an outdoor activity like going out for a bike ride. If it is not going out for shopping or for a nice meal, all they want to do is to stay home and interact with their “screens” (Tables, Smartphones, PlayStation, TV, etc.). It had been a while since I had a bike ride with them and today was such a nice day that I had to “put the foot down” (whoever watched “Inside out” with their kids will remember this). Well, in my case, “put my foot down” was followed by a bribe… the promise of a nice meal in one of our local pubs, the Peacock Farm, which they love (food is really great). I guess cyclist parents want their kids to like their sport of choice, as much as football or rugby parents want their kids to like theirs. The competition with the screen is tough though, but there is nothing that a bribe won‘t get you these days with them. We thought them, perhaps, too well to negotiate in their favour. Nevertheless it was a great day out… sunny and colourful. Hope you enjoy the video. If you like this post, please share, like, Tweet or at least let me know how I am doing by clicking on the stars below. I´ve put this short video together for those Mums and Dads with children transitioning from 12″ or 14″ bikes (balance bikes or bikes with training wheels) to bigger 20″ wheels. A Tag-Along (or sometimes referred as a “Tag-a-long”) bike has some PROS and some CONS, but I think the PROS outweigh the CONS. Parents can safely ride with their kids at higher speeds than they would be able to if the kids were on their own bikes (mind you higher, not “high”). Allows older children to be towed on longer journeys. Child can pedal as much or as little as they like. Depending on age they can tire pretty quickly. Harder workout for the parent. Fit parents are an example for their children. Generally only available with a 20″ diameter rear wheel. Cannot be used at the same time as a rear mounted baby seat, so may be a 1 child solution only, but depending on the age of the 2nd child a Kangaroo seat can be an option if you have children with significant age differences. Parents need to be careful as movement by the children may cause a wobble that can throw the parent off-balance. 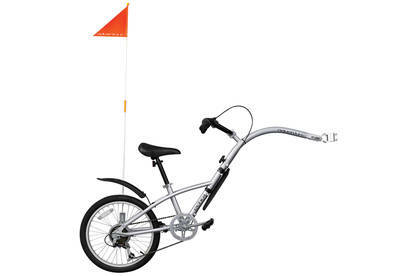 Adventure Echo Six Tag-Along Bicycle. Half a bike, but double the fun. Don´t expect this to be a technical article about the bike. You can search Google for that and will find plenty of information (or you can click here), much more than my very limited technical knowledge can cover on it or any other bike, as a matter of fact. This goes to all the Moms and Dads who have small kids that have outgrown their bicycle seats. After a very successful couple of years using the Wee Ride Kangaroo seat, somehow my youngest managed to outgrow it in what it seemed from one day to another (of course not). Fact is the seat was too small and although he has a junior 12″ bike with training wheels, it would not be fun to ride alongside him on that. Me and my son on his Adventure Echo Six Tag along Bike. I was looking for something we could ride together and at a pace that would be safe to him, but not boring to me. I thought it would be a nice way to enjoy time with him and perhaps make him enjoy bike riding. Tag-Along bikes are simple by design and don´t change much. The nice thing about this particular model is the 6 speed Shimano gears that helps children understand gearing at an early age and the fact that it has a foldable design, making it easier to fit in a car or in the shed. 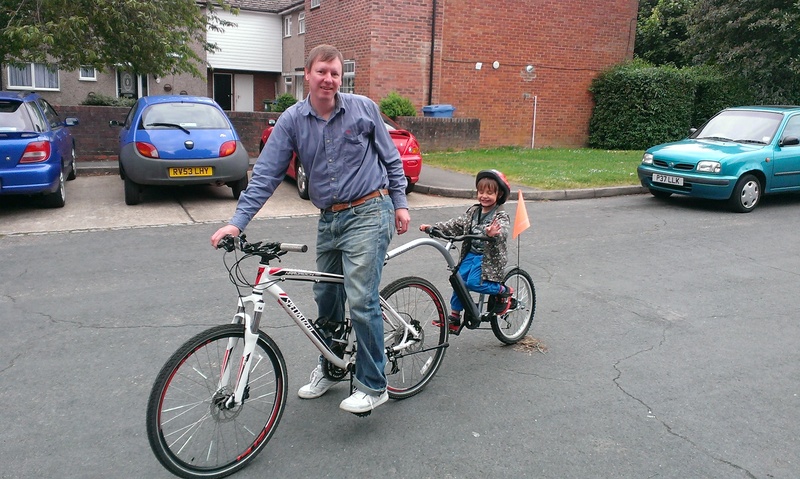 A tag-along is a safe and great way for Mums and Dads to spend quality time with their children on a bike.